I'll admit it, I'm an Internet Genealogist. I have two small children and there's just something about a loud 3-year-old that doesn't work in a library. I have found over the years that I can find some of the best ancestry information on the Internet. 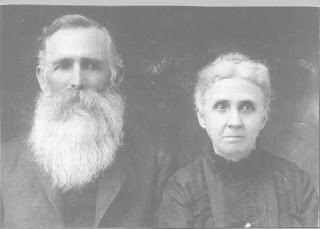 Whether it is from a monster genealogy site like Ancestry.com or FamilySearch.org or just a small county GenWeb site, there is always something great to find on the Internet. But I have learned that while the Internet is great there is often no replacement for setting your feet on the ground of your ancestors. Early last year my family took a ski trip to Colorado. We took our time driving home and took a different route through Oklahoma than we had taken before. As we were driving down the highway, I started seeing exit signs for the city of Pawnee. I knew it was familiar, but I couldn't place it. Then it hit me: Pawnee was the city I had researched for my Creed line. Gussie Creed is my great-grandmother on my father's side and I knew that she and her parents had lived in Pawnee County, Oklahoma. We were this close...I just had to go. So I asked my husband to take a brief detour just to see the town. Our decision was quick as we had to take the next exit. I knew that Gussie's parents, Joseph and Mary (Reece) Creed were buried in Pawnee so my initial thought was to just find the cemetery they were buried in and pay my respects. To find that information we headed to the local library, which we found through street signs. The librarian was very helpful, and was also a genealogist, so she lead us directly to the bound book that kept the cemetery information. We quickly found my ancestors in Highland Cemetery. Overhearing our find, the librarian stated that she had a layout of all the graves for that cemetery and she made a copy for us. She also suggested that we visit the Pawnee County Historical Society Museum on the square. A good nugget of information, as we were not aware of the museum. In the meantime, my husband walked around the square, in an effort to keep my young son from getting bored at the museum, and explored the town. He came across a great drug store and an antique store where we ended up buying a couple of lamps. And at the end of our visit we stopped by the cemetery and paid our respects. I'm not sure what I had hoped to see in Pawnee, maybe just to know that I had walked in their footsteps. In our brief 2-hour stop I was not only able to do that, but learned information I had not known and patronized businesses in small-town America. This short adventure is one we still talk about. I had often wondered why the Creed family had come to Oklahoma and stayed. Having visited and met the locals I know exactly why they stayed. You just can't find this kind of stuff on the Internet! Heather, I too must admit that I am more of an internet genealogist - also having small children in our home, makes for tough trips anywhere sometimes :) Your post reminds me of a volleyball tournament I attended for one of my kids in the fall - 3 hours from home and wow! a few miles from the town of one set of my ancestors. I just HAD to make a trip/stop/visit somehow I had to do it. While I didn't have the time you managed to get from your stop, it really felt good to be there among them in the cemetery. It pays to venture out when we've got the opportunity to do so! I have had success after success with small town organizations when researching my family. We are also military but have never been lucky enough to be stationed close to where our families were from. Maybe some day! I loved this story. I once wandered through a tiny village in Yorkshire (Barton-le-Willows) and got talking to a lady over a fence. It turned out that her husband was related to me! The HUDSON family left the village in the 19th century but some descendants had returned many years later. I enjoy your blog, and I have nominated it for the Ancestor Approved Award in a post at Genealogy Leftovers.